For information on obtaining and using alcohol, see the Sample Preservation page. 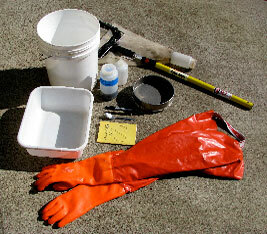 Field sampling requires a sieve to concentrate samples by draining off water. U.S.A. Standard Testing Sieves are available directly from the Gilson Company or through scientific supply houses. Sieves are available in a variety of diameters, mesh sizes, and in brass or stainless steel. A standard height, 8″ diameter sieve is best. The 500 micron sieve is No. 35. The 250 micron sieve is No. 60. While more expensive, stainless steel will last longer than brass with regular field use. Buckets are handy for carrying gear to the field site. They are useful for collecting clean water for rinsing samples. Large rocks and cobbles can be placed in a bucket with a small amount of water and gently scrubbed to dislodge invertebrates. The water can then be poured through a sieve, and the sample transferred to a container. Five gallon plastic buckets are available at paint or hardware stores. Dish and pot scrubbing brushes with 6-8″ handles and stiff plastic bristles are ideal for brushing invertebrates off rocks. They are available at most grocery and variety stores. The short handle is useful for stirring fine grain stream sediments to dislodge invertebrates into the current. Brass or wire brushes will mangle invertebrates, and should not be used. Utility forceps are ideal for field work. These are available from Carolina Biological Supply. Look for the stainless steel 6-inch curved utility forceps, item number 624540. Sorting tubs are used to clean large debris from samples before concentrating in a sieve and transferring to a sample bottle. White dish tubs are ideal, and are available at grocery and variety stores. Aquatic Biology Associates, Inc. recommends 5 ml borosilicate glass shell vials from Research Products International Corp. for storing laboratory processed invertebrate specimens. These inexpensive snap-cap vials are 15 mm X 45 mm and come with polyethylene stoppers having double sealing rings for a leak-proof seal. When filled with alcohol and properly sealed, the sample will not dry out for 10 or more years. Vials should be checked every few years for loss of preservative. Look for catalog number 125502. The price is about $200 for a case of 1152 vials. Field notebooks and reams of paper for copying field forms are available directly from the J.L. Darling Co, or through forestry supply outlets.